The UT Dallas Computer Science Department’s Grace Series Lectures continued with Dr. Ranran Feng as the featured speaker at the beginning of November.  The objective of the Grace Series is to present a program of lectures about the role of women in today’s technology fields, as well as to provide inspiration to female graduate and undergraduate students studying computer science and software engineering. The Grace Series features talks by the UT Dallas Computer Science faculty and other distinguished lecturers. Drs. Kumar, Straach, and Linda Morales conceived the idea of the Grace Series talks at UT Dallas after attending the Grace Hopper Celebration of Women in Computing (GHC) Conference last year. The conference, aptly named after the woman who helped pioneer computer programming, Rear Admiral Dr. Grace Murray Hopper, involved a series of presentations designed to bring research and career interests of women in computing to the forefront. The UT Dallas Computer Science Grace Series lectures are modeled after the GHC Conference format. Drs. Pushpa Kumar and Linda Morales, both UT Dallas CS faculty members, delivered opening remarks before turning the floor over to Dr. Feng. 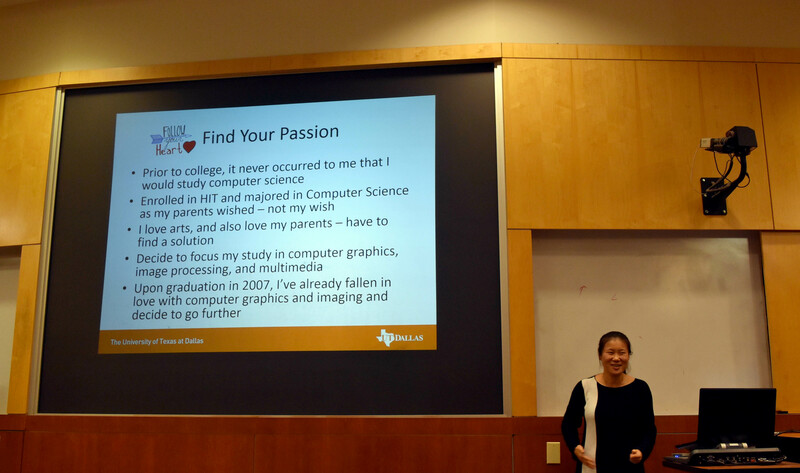 Dr. Feng, a Senior Lecturer of Computer Science at the University of Texas at Dallas CS department, delivered her talk titled “The Path and the Features.” Her talk began with a short biography of herself. Dr. Feng was born in the northeastern part of China. Her father was an engineer and her mother was a government officer. Both her parents had gone through the Culture Revolution between 1966-1976, thus creating great expectations for their daughter’s future education. Dr. Feng attended a strict military based boarding school for six years. Attending boarding school based on military discipline, Dr. Feng learned the art of self-discipline, which would serve her well later in her education. Growing up, Dr. Feng dreamed of becoming an artist and spent 13 years learning the art of Chinese Brush painting. She also loved music and baking. Prior to attending college, Dr. Feng had never thought of studying computer science, which was the major her parents had urged her to do. In order to incorporate her passion for art, Dr. Feng was able to find an amicable solution; she decided to focus her study in computer graphics, image processing, and multimedia. After her graduation in 2007, she decided to further her education in computer graphics, image processing, and multimedia by pursuing a PhD at the UT Dallas Computer Department, with her research focusing on multimedia. In order to gain valuable industry experience, Dr. Feng interned for Image Vision Labs, Inc. (a video multimedia content analysis/IT Company). Upon her completion of the PhD program, she continued at Image Vision Labs as a research scientist working on video multimedia content analysis. 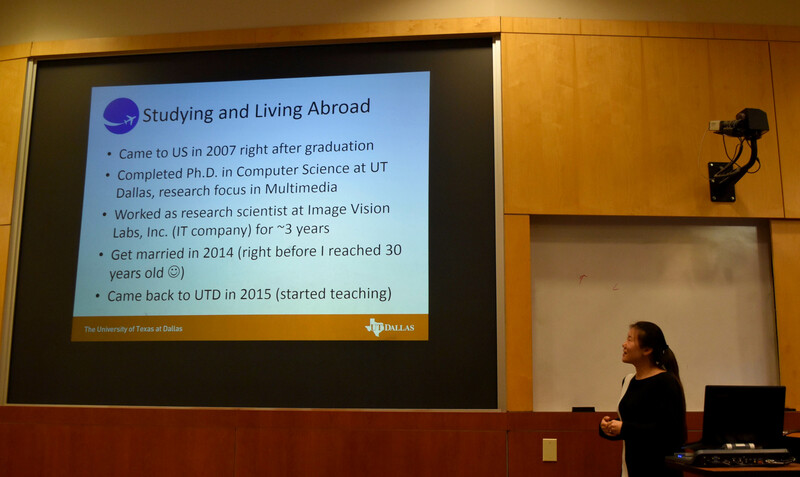 In 2015, Dr. Feng returned to UT Dallas campus, teaching computer graphics in the UT Dallas CS department. Dr. Feng’s research focuses on computer vision; specifically face detection, face recognition, facial beauty analysis, and pet face detection and recognition. 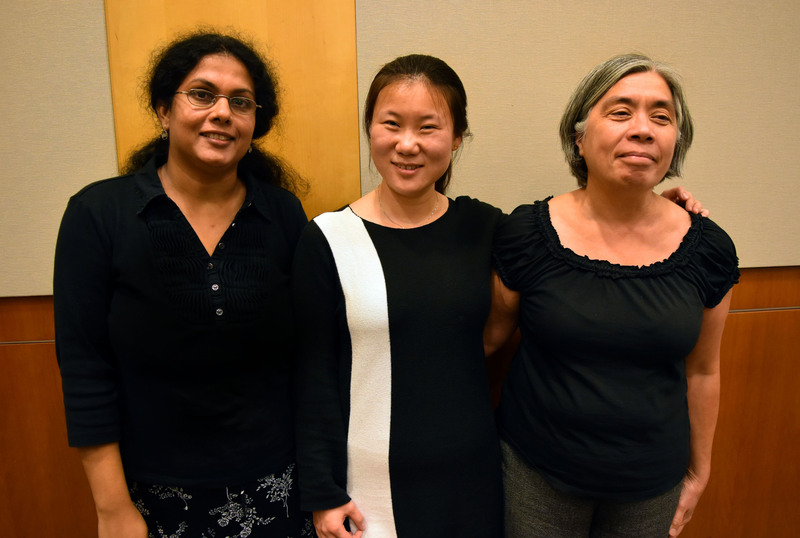 From the Left: Dr. Pushpa Kumar, Dr. Ranran Feng, and Dr. Linda Morales.